How did Karen acquire the handgun? In The Punisher S01E10 "Virtue of the Vicious", there is a scene where Karen is held at gunpoint by Lewis and is also wearing a bomb vest. The Punisher (Frank) quite craftily signals Karen to pull out a wire to defuse the bomb. As soon as she pulls out the wire, she reaches in to her purse and fires a shot into Lewis' foot. She then goes on to pull out and reveal a handgun from the purse. 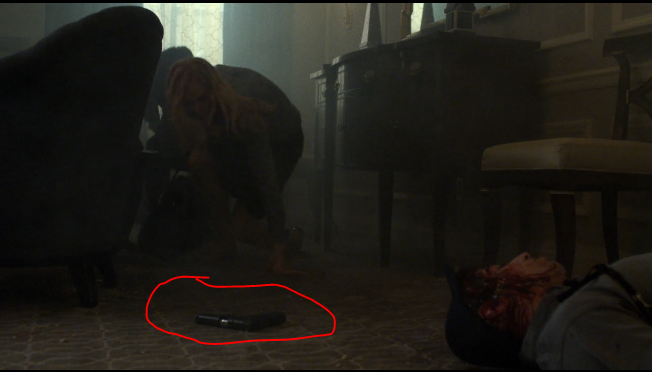 If I remember correctly, in the beginning of the episode when Karen walks in for the meeting with the Senator, she meets Billy Russo who specifically mentions her weapon being taken away from her for the duration of the interview and that it will be handed back to her on her way out. Seeing that the meeting never concluded, owing to the assassination attempt by Lewis and Frank's intervention, it's safe to assume that the Anvil's security team never gave Karen her gun back. Then how did she come by the one she shot Lewis with? Is this a plot-hole or did I miss something? The one Karen takes out of her handbag is one dropped by one of the security guards after the explosives go off. We see her look in her purse and realise that she doesn't have her weapon. When Frank intercepts the bullet Karen scrambles behind some furniture and we see the new gun lying on the floor. She picks it up and puts it in her handbag. Not the answer you're looking for? Browse other questions tagged plot-explanation marvel-cinematic-universe the-punisher-tv . How did Odin come to leave the Tesseract on Earth? What scene in Full Metal Jacket was the “Ann-Margret” joke in Netflix “The Punisher” referencing? Why did Frank Castle save the kid during the robbery? How did Tia Dalma acquire Captain Barbossa's body? How is one “Deemed Worthy”, to acquire the Greatsword “Dawn”? Where did Bellamy get the first handgun?